For hundreds of thousands of Australian animals exported to the Middle East, this week will be a nightmare. 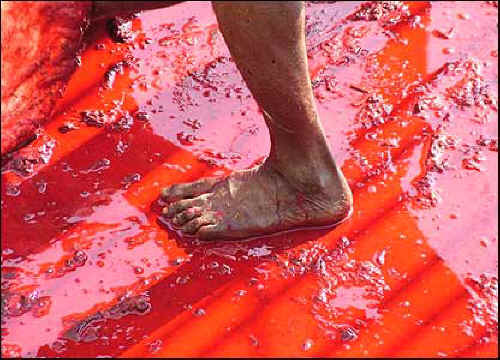 It is the week the streets quite literally turn red with blood - their blood. It is the week of the Islamic Festival of Sacrifice - or Eid al Adha - celebrated each year at the conclusion of the Hajj pilgrimage to Mecca. According to the Old Testament, Abraham was commanded by God to sacrifice his son but, just as he was about to sacrifice him, an angel stopped him and gave him a ram to sacrifice instead. The Eid al Adha commemorates Abraham's willingness to obey God. During this three day festival, millions of peaceful sheep, cattle, goats and camels will be subjected to a terrifying and violent death. Last year in Saudi Arabia alone, 685,000 animals were sacrificed and globally the numbers killed were around 20 million. In 2006 Animals Australia’s Communication Director Lyn White witnessed first hand the brutality of this festival. She stated, "I had been told that on the morning of the Eid the streets of Cairo ran red with blood. I did not think for a moment that this could be true". "I was soon to learn that this was an accurate portrayal of this terrible day. In every street crowds were gathering watching animals being slaughtered on footpaths and driveways." The quadrangle of a shopping centre " turned into a sea of blood as the sheep were brutally slaughtered." Although Australia has been exporting animals to the Middle East for 30 years it was not until Animals Australia investigators went there in 2003 and 2006 that the barbaric treatment of our animals was exposed. Investigators witnessed sheep and cattle being kicked, beaten, dragged off boats by their ears and legs, tossed from trucks and abandoned in barren feedlots. They witnessed sheep being tightly bound with twine and thrown into car boots and cattle having their tendons slashed and eyes stabbed with knives. They witnessed bound sheep, lined up in rows, having their throats slit in full view of one another. In Kuwait they saw a trussed sheep loaded into a wheelbarrow then pushed to the door of a boarding house. He was then dragged up two flights of stairs before being slaughtered on the floor of a filthy communal toilet. Of course, even before Australian animals arrive in these countries they will have suffered enormously. The voyage itself is so horrendous that many animals fail to survive it. In 2008, 36,490 animals died at sea and just last February, on a 22 day voyage to Egypt aboard the Ocean Shearer, 300 cattle and 360 sheep perished. Of course, too, every single animal exported from Australia - even if it's not at the time of the Eid - will meet a grisly and cruel death since ritual slaughter is the norm in all importing countries. All animals will have their throats agonizingly cut whilst fully conscious and all will die slowly and terrifyingly. For our Federal government to allow around 3-4 million sheep, 900,000 cattle and 97,000 goats per year to be sent to this unspeakably cruel fate is both shameful and inexcusable. Surely it's time for all Australians to demand an end to this barbaric and inhumane trade that condemns so many innocent animals to such enormous, and needless, suffering.